This concept is based on the assumption that by leasing network capacity to companies that have a strong consumer brand, or a close relation with and access to specific market segments, can leverage these assets to develop segment specific packages, and as such create new revenue streams. Because like this, specific segments can be served much better with service packages tailored to their specific needs, this concept can lead to a substantial increase in ARPU and reduction of churn in these segments and as such create a win-win situation for both the MVNO and the MNO. 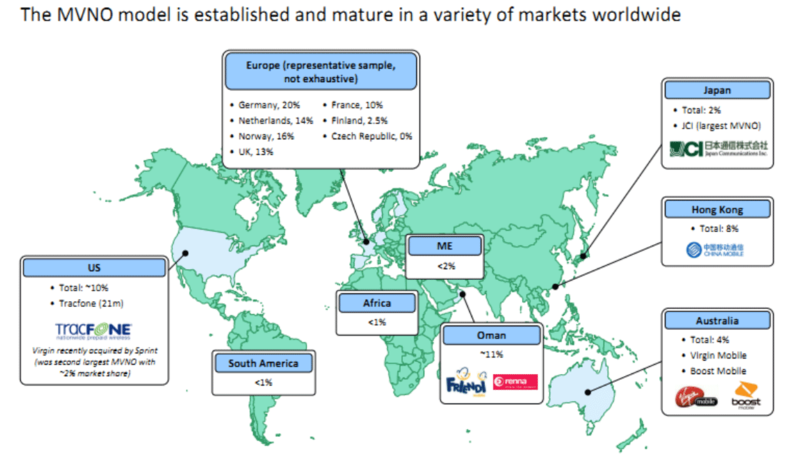 Over the last 10 years the adoption of the MVNO model on a global scale has been massive with more than 700 MVNOs to date, serving more than 160 million mobile users, especially within the highly developed Telecom markets of Europe, the US, and the Far East. Also the coming years the number of mobile users being served directly by MVNOs around the world is expected to experience a strong growth and reach an average global market share of between 15 and 20%, with the strongest growth to be expected in the emerging markets of the LATAM, Africa and the Middle East. So from this point of view the MVNO concept appears to be a success and is expected to play an increasingly more important role in the mobile industry. However, when taking into consideration the relatively poor financial performance of many MVNOs, with a negative EBIDTA or just break-even, there is less reason for optimism. What went wrong is quite clear. Where the MVNOs where expected to develop segment specific packages, as such creating added value in the distribution chain, most of them couldn’t think about anything else then just reselling the basic service of the MNO for a lower price to the end-user. In some countries, like for example Denmark, this has led to such a dramatic fall in end-user prices, that it even puts at risk the high investments required for the future upgrading of the mobile networks for next generations of mobile services. 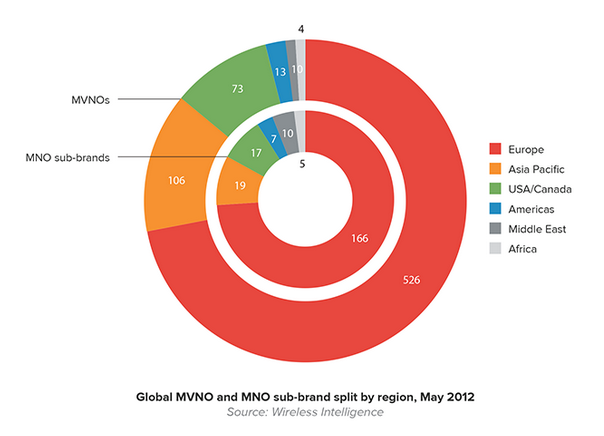 So is there no future for new MVNOs? Yes off course there is! Just make sure you do it right! So before entering into the MVNO adventure every company has to make a thorough analysis of its target segments and define a segment specific offer which really appeals to the specific needs of this segment and that really creates added value and a strong differentiation in the market. 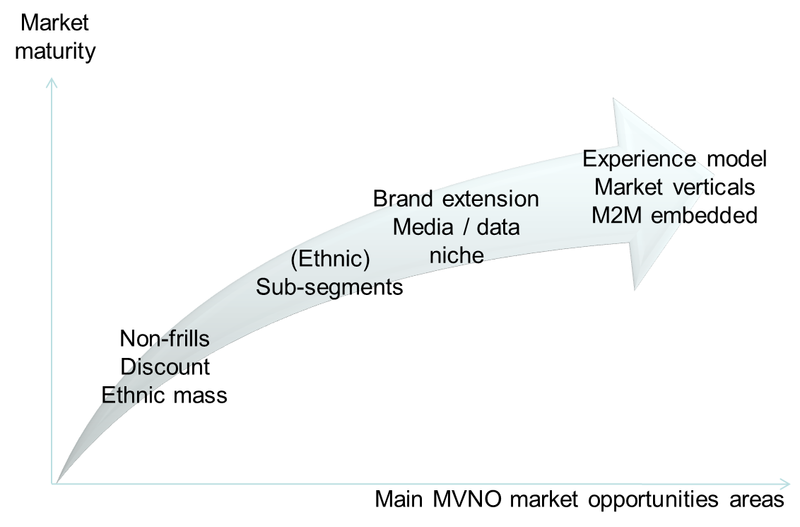 Besides this potential MVNOs need to execute a comprehensive market assessment to determine the maturity level of the market and with that define the main MVNO opportunity areas in the market. To support you in this demanding and crucial task LTT Business Consulting has developed a comprehensive and structured methodology to support you in all the steps of the MVNO business planning & execution process, as further explained under “Services”. With the objective to be able to launch highly tailored services, with very short lead times, that will allow the MVNO to obtain a strong competitive position towards the MNOs and other MVNOs in the market, and to reduce CAPEX in systems to a minimum as such being able to allocate the fast majority of the available financial resources in Marketing & Sales, most MVNOs can reach these objectives with the use of the right MVNE that can provide the necessary systems, services and support as a managed service with a monthly a hosting fee. For smaller MVNOs it is a more feasible scenario to sign an airtime wholesale deal with its MVNE, who is able to aggregate the smaller traffic volumes of multiple smaller MVNOs, as such being able to obtain competitive airtime wholesale tariffs from the host operator. Because LTT Business Consulting has obtain wide experience, form the execution of multiple project for as well MNOs, MVNOs, MVNEs as MVNAs across Europe and LATAM, we do have the complete overview of the value chain, and as such can provide each player with a tailored approach which fits into the overall picture.